In the fifth and final post in our series on renewable natural gas (RNG), we look at some of the challenges to the widespread use of RNG for transportation. There are promising developments in Europe and the United States that show tremendous potential for RNG in transportation. Several challenges exist, though, to commercial-scale use of RNG fuelled vehicles – including reliable feedstock availability, cost/economics of RNG production, the regulatory and policy structure, and infrastructure/fuel specification uncertainties. The first three challenges are highly interrelated, and each affects the others. The availability of biomass feedstock is critical to expanding the use of RNG. In Europe, key factors for future supply are availability of land for RNG production, regulatory structures that either stimulate or inhibit growth in supply (e.g. regulations for waste water treatment and landfills), sustainability requirements (e.g. limits on land use conversions), and shifting supply-demand dynamics. Competing demands for RNG, such as meeting renewable electricity generation targets, can also affect the availability and price of RNG for transportation. The economics of RNG are driven by a number of factors, not least because RNG is a relatively new fuel type for transportation with a small market share. On the supply side, production and delivery costs to the pipeline can make it more costly than compressed natural gas (CNG), although still cheaper than gasoline and diesel, according to the analysis (below) of the California market. Without incentives, like tax treatment (e.g. Germany’s RNG processing bonus or Sweden’s energy tax deduction for CO2 neutral vehicles and RNG producers), and/or some form of greenhouse gas (GHG) emissions pricing that recognizes RNG’s environmental benefits, it’s challenging to develop RNG compared to lower-cost non-renewable fuels. The third area, regulation and policy, also has a large impact on both availability of the feedstock and the cost of producing and selling RNG. But most policies in the U.S. on renewable and low-carbon transport fuels favour liquid biofuels. And the renewable portfolio standards (RPS) in roughly 30 U.S. states (along with other incentives for renewable power) tend to direct RNG to electricity generation instead of transportation. Europe has a clear path for developing renewable sources over the long term via its Energy and Transportation Roadmaps, and countries such as Germany and Sweden have taken the lead in deployment. In the U.S., the gaseous fuels renewable fuel standards together with liquid biofuels (federally, only liquid biofuels are included in the Environmental Protection Agency’s “RFS2”), can help develop RNG as a transportation fuel. Policies such as California’s GHG offset protocol for methane capture from livestock projects can be adopted in other states – either for voluntary or compliance purposes - to help meet the challenges of limited and costly RNG. In Europe, policies such as the European Union’s (EU) Directives on renewable energy, recycling and landfills, together with National Renewable Action Plans help focus activities and resources toward meeting the EU target for 20% renewables by 2020. Can RNG be injected into natural gas pipelines? Barriers include lack of a universal definition of trace gases/impurities permitted (RNG composition is dependent on the makeup of the feedstock), and a lack of quality assurance that RNG for transportation use is sufficiently upgraded from biogas. 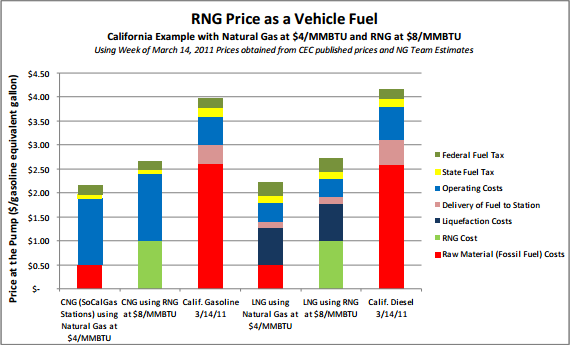 Can RNG or a blend power my natural gas vehicle? Barriers include lack of a common gas specification standard for RNG for transportation (i.e. a vehicle engine standard that clearly identifies allowed or disallowed trace compounds that can affect engine performance and life). The last challenge is practical: how to get the upgraded RNG to the pipeline network, when the best sources for transportation (landfills and livestock) may be far from access points? Here, a combination of incentives and connection standards or obligations can encourage distribution networks and RNG producers to establish cost-effective connections. Non-energy crop sources including agricultural waste, landfill gas, and new approaches such as “power to gas” from wind etc. can have considerably smaller footprints. Floris van Foreest, “Perspectives for Biogas in Europe,” The Oxford Institute for Energy Studies, NG 70, December 2012. National Petroleum Council, Renewable Natural Gas for Transportation: An Overview of the Feedstock Capacity, Economics, and GHG Reduction Benefits of RNG as a Low-Carbon Fuel. Topic Paper #22, NPC Future Transportation Fuels Study, August 1, 2012, p. 13. Accessible at http://www.npc.org/FTF_Topic_papers/22-RNG.pdf. van Foreest, “Perspectives for Biogas in Europe”, Figure 12. GHG-emitting firms who need to reduce their footprint are thereby encouraged to invest in these offset projects. An example of a standard that can assist customers and fuel providers alike to understand engine requirements for RNG may be found on the Cummins Westport website – technical bulletin at bottom of page. http://www.cumminswestport.com/biomethane.